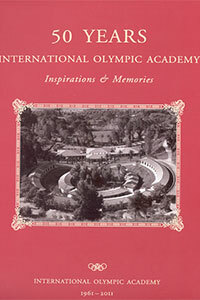 On the occasion of the celebration of the International Olympic Academy's golden jubilee, the IOA issued an anniversary album with the personal reminiscences and stories of 50 friends and fellow travelers from all over the world who are only a symbolic sample of the thousands of friends of the Olympic idea who were involved in the IOA's educational work. The authors were invited to revisit the IOA's activities from a personal approach. Their stories eloquently reflect their sentimental ties to the IOA as they highlight the Academy's contribution to the Olympic Movement and Olympic education. The publication contains photographs with the authors' memories, from their personal records or from the IOA's photographic archive. It also includes the traditional commemorative pictures of the participants from the IOA's archive, which cover its 50 years of operation and constitute an informal "directory".